I’ve been to Hong Kong for work, what a great city, such a mesmerizing mix between east and west. But this post is not about Hong Kong it’s about a lovely little tart. Before I left, I went berry picking again and fortunately got a bit luckier this time. Ended up picking 3 kg of raspberries, yep got a bit obsessed. So except from having raspberries for breakfast everyday, I made raspberry fools, jam and this lovely little no bake tart. This is a great recipe and you can vary it in so many ways, skip the passion fruit, or the berries or swop the lemon curd for any other curd or jam. Basically it’s the perfect little thing. Place biscuits in a food processor and crush to fine crumbs. Add melted butter and pulse to combine. Press into a tart pan and let chill for 30 minutes. Whip the cream in a large bowl and mix with mascarpone, yoghurt, lemon curd and passion fruit. The texture should be firm but fluffy. 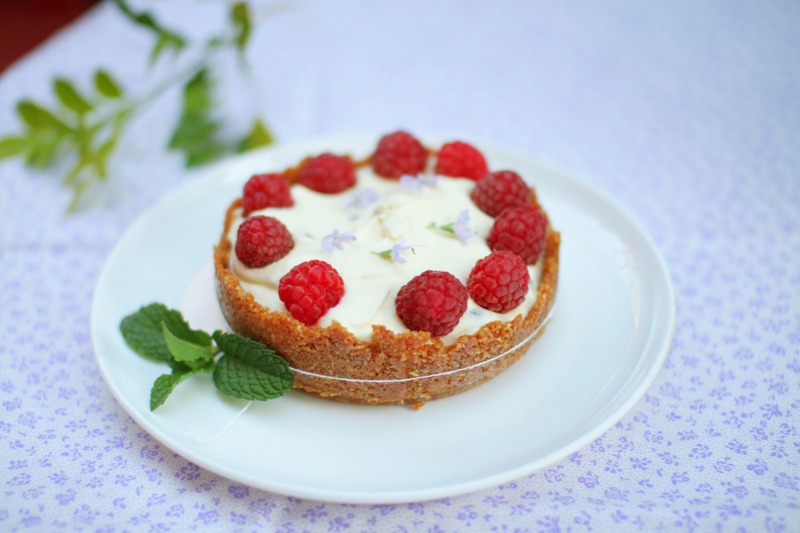 By now the tart crust should be ready, fill it with the cream and decorate with raspberries. And (if you have any) some rosemary flowers, it really adds depth to the flavour and fun twist to it. This looks like such a perfect summertime dessert. Yum! Looks yummy! Love that it’s no bake.